BACKGROUND: South Africa suffers from an unusually high unemployment rate - officially averaging 25% since 1999Q3. In addition, depending on whether one uses the official or broad definitions of unemployment, since 2008 there are on average between 2 and 3.3 times as many unemployed people as there are people in the informal sector. Hence the question: why do the unemployed not enter the informal sector to create a livelihood? AIM: To fill this gap we propose a macro-economic framework that incorporates both formal (primary) and informal (secondary) sectors, as well as involuntary unemployment resulting from entry barriers to the labour market. We believe such a model provides a more suitable basis for macroeconomic policy analysis. SETTING: Standard macroeconomic theories at best provide a partial explanation for the South African unemployment problem, focusing mostly on the formal sector. METHODS: The article uses a theoretical analysis. RESULTS: The article presents a macro-economic framework that incorporates both formal (primary) and informal (secondary) sectors, as well as involuntary unemployment resulting from entry barriers to the labour market. CONCLUSION: If the assumptions on which the model draws hold in the South African reality, then a solution to the unem-ployment problem involve policies addressing product and labour market structures and behaviour in the primary sector, as well as policies addressing the numerous barriers to entry, such as borrowing constraints, that poten-tial entrants into the secondary sector face. Few countries have as serious an unemployment problem as South Africa. In the pe-riod 2008Q1-2018Q2 the official unemployment rate averaged 25.1%, while the broad unemployment rate (which includes discouraged work-seekers) averaged 34.8% (StatsSA 2017). A well-known peculiarity of South Africa is that, compared to peer-group countries, the infor-mal sector is small relative to total employment (Kingdon & Knight 2004). Almost 17% of employed workers are in the informal sector (see Table 1). In addition, and depending on which unemployment definition is used, since 2008 there have been between 2 and 3.3 times as many unemployed people as informal sector workers (Figure 1). This raises the following question: if workers do not find employment in the formal sector, why do they become unemployed rather than enter the informal sector? Kingdon and Knight (2004) suggest that there are significant barriers to entry into the informal sector, possibly in the form of capital and skills shortages. South Africa is not the only developing country where barriers to entry into the informal sector appear to exist. Grimm, Krüger and Lay (2011a) and Grimm, Van der Hoeven and Lay (2011b) find significant barriers to entry into the informal sector of many West African countries, as well as Madagascar. A characteristic of almost all the macroeconomic work on unemployment in SA is that it deals with the formal sector only (Fourie 2011). 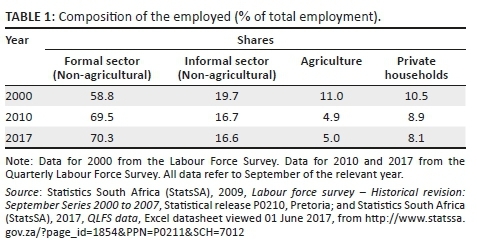 Meanwhile, evidence from unemployment research in the fields of labour economics and development indicate substantial segmentation in the South African economy: between the formal and the informal economies, within the informal sector, and between the unemployed and the informal and formal economies. Moreover, several labour market barriers exist that prevent people from improving their employment and earnings situation. The objective of this article is to start bridging the divide between the macroeconomic discourse and the labour and development discourses on unemployment by developing a model that includes labour market segmentation and entry barriers into a theoretical macroeconomic model. A major result of this model is that, given these incorporated fea-tures, it explains the existence of persistent high involuntary unemployment in equilibrium. Modern macroeconomic theory largely focuses on the formal sector, ascribing unemployment mostly to product and labour market imperfections, as well as hysteresis (see Cahuc & Zylberberg 2004; Carlin & Soskice 2006: chapter 15 for textbook expositions). What these models do not consider or explain is why those who lose employment then become unemployed and not self-employed. In the South African case we can expand this question and ask: why do the unemployed not enter the informal sector? Discussing the informal sector draws segmented labour markets into the discussion. Agénor and Montiel (1999) present a theoretical model incorporating a formal and informal sector. Basically it represents a model with internationally traded and non-traded goods, with the former constituting the formal sector and the latter the informal sector. This model is of limited value in South Africa, as its informal sector, being largely retail-based, is a sector of traded goods. Another branch of the literature represents the attempts by Layard, Nickell and Jackman (1991:41-44; also Blanchard 2005), as well as the earlier, but theoretically more detailed model of Bulow and Summers (1986). These models include a primary and a secondary sector. The primary sector typically has New Keynesian features (e.g. it is an efficiency wage or union bargaining sector). Excess primary-sector labour supply flows to the secondary sector. While the primary sector in this model is New Keynesian in nature, the secondary sector is surprisingly very New Classical. The secondary-sector labour market is assumed to be market clearing 'in the sense that wages are not high enough to attract a queue of job-seekers, nor do vacancies last long since skill requirements are low' (Layard et al. 1991:42). Such a market-clearing secondary sector means that those who are not employed in either the primary or the secondary sectors are both voluntarily and involuntarily unemployed: they are 'involun-tarily unemployed with respect to primary sector' at the going wage there, but simultane-ously they are 'voluntarily unemployed with respect to the secondary sector' (i.e. not willing to work at the going wage in the secondary sector). Thus, in the final instance they are voluntarily unemployed. Therefore, the Layard et al. and Bulow and Summers models still leave the question: If actual unemployment is high, why do those who become unemployed in the primary sector, stay unemployed and not all become (self-) employed in the secondary sector? Kingdon and Knight (2004), Grimm et al. (2011a) and Grimm et al. (2011b) suggest that those who wish to enter the secondary sector face significant barriers to entry, possibly in the form of capital and skills shortages. In the mathematical macroeconomic model presented below we incorporate some of these barriers. This section develops a mathematical three-segment model for an economy such as that of South Africa (for more background and explanation, see Burger & Fourie 2015). The section draws on the dual labour market model of Bulow and Summers (1986), which itself is an augmentation of an efficiency wage model - a prominent approach in the New Keynesian class of models. Following Summers (1988) as well as Knell (2014), Pereau and Sanz (2006), Bulkley and Myles (1996) and the suggestion by Bulow and Summers (1986), the article introduces union bargaining into the model to allow for the presence of strong labour unions in the South African economy. Similarly, the presence of high economic concentration and imperfectly competitive product market conditions is an integral part of our augmented model. As mentioned, the Bulow and Summers (1986) dual labour market model explains the allocation of workers between the primary and secondary sectors - but not the existence of involuntary unemployment. Drawing on Kingdon and Knight (2004) and Grimm et al. (2011a), the model also incorporates barriers to entry into the informal sector to explain why the unemployed do not enter the informal sector, and remain unemployed. We derive a formal-sector job-offer relationship and an effort supply function.1 Different from the analysis in Bulow and Summers (1986), this analysis is done in terms of the number of positions filled by firms rather than the number of workers demanded, which allows the introduc-tion of factors that will influence the number of positions being filled by firms in the two sectors. Nevertheless, the model is presented in terms of both the number of positions and the positions filled (persons employed). In addition to these two relationships, the analysis below also presents wage-setting and price-setting relationships. These four relationships are then used to derive equilibrium condi-tions for the primary and secondary sectors. The allocation between the two sectors can be described in terms of the proportion of total positions filled by firms in the primary sector being p = Fp/F, while the proportion filled by firms in the secondary sector is (1 - p) = Fs/F. In equilibrium, labour flows into and out of the primary sector need to be equal. Thus p(qp + d1) = qs(1 - p), so that qp + d1 = qs(1 - p)/p. This equality also means that search for work in the primary sector occurs not from a position of unemployment, but from the secondary sec-tor (in the two-sector model there is no aggregate unemployment). where (d2 - d1)(PVp - PVs) represents the gain from non-shirking/effort; PVp is the present value of primary sector work and PVs the present value of secondary sector work (recall that non-effort is only possible in the primary sector, the sector that pays a wage premium over the secondary sector wage). This conditional expression shows the premium that firms pay (the right-hand side of Equation 3) to overcome the gain that workers derive from not exerting effort (the left-hand side of Equation 3), thereby ensuring that they exert effort. Unions having more power implies a higher value of α2 and therefore a higher value of α; consequently, the difference between the present values of primary and secondary sector wages will be higher. Similarly, the larger α3 and D, the larger will be the value of α. The inclusion of the term α3D means that both distance and the cost per unit of distance impact the reservation wage of workers - and negatively affect job search. If people live far from places of work in the primary sector and have to travel to places of work, they may not be able to afford job search. Note that this particular search and/or entry barrier can be seen as principally due to a financial market failure. Job-seekers find it hard to borrow money to finance their traveling and search costs (intending to repay the loan upon finding a job). Lenders might be unwilling to extend such loans due to both a low probability of finding a job and a low expected wage. Equation 8 represents the effort supply function (Equations 3 and 5 above) in a different form that shows the relationship between the wage and the proportion of positions filled in the pri-mary sector: as p increases, wp decreases. It also expresses the primary sector wage as the secondary sector wage plus a mark-up. (It still is an effort supply function: the mark-up or premium is what needs to be paid to primary sector workers to ensure effort.) Thus, the rela-tive proportion of positions allocated to primary sector jobs (p) has an impact on the size of the mark-up on the secondary sector wage rate. This is shown graphically in Figure 2. Note that, as p increases the slope of the relationship becomes flatter, while the intercept decreases (i.e. as p increases, wp shifts and rotates from wp1 to wp2). where the size of γ relates to the size of the mark-up of a monopolistically competitive form; the higher γ and therefore the closer it moves to 1 (i.e. the closer ε moves to infinity and therefore approaches the perfectly competitive model), the lower the mark-up can be and the less the firm can benefit from its monopolistically competitive position. 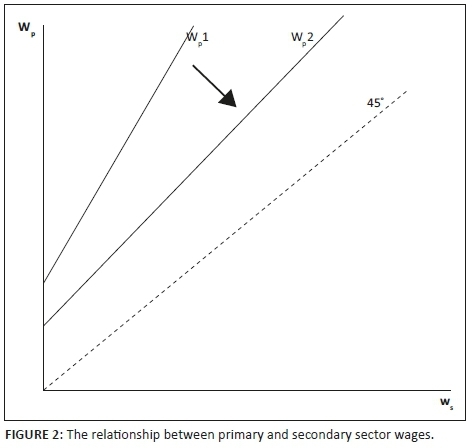 Equation 10 represents the standard primary sector price-setting relationship linking employ-ment and wages: given that g' < 0, wp decreases as Ep increases (but the wage cannot turn nega-tive). Thus, at higher levels of Ep the real wage is lower (because the marginal product of labour is lower), and hence so is the proportion of positions filled by firms in the primary sector, p. Of course, if, for a given level of employment, the marginal product of labour increases - for instance, due to an upgrade in skill levels - the number of positions offered in the primary sector will increase. Thus, the positive sign of h means that if workers are more productive, more workers can be employed at a given wage. Note that in terms of Equations 10 and 11a there is a positive relationship between p and wp, but a negative relationship between Ep and p (given that g' < 0): as Ep increases, wp decreases, causing p to also decrease. Equation 12 is a primary sector wage-setting equation with its characteristic positive relation-ship between the level of employment and wages. As Ep increases (and given that g' < 0), wp increases, simply because, as employment in the primary sector increases (and hence as employ-ers offer more jobs), workers can get work easier elsewhere in the primary sector (the probability of getting a job in the primary sector is larger if a larger proportion of total jobs are filled in the primary sector) - hence firms need to offer a higher wage to ensure that they stay, exert effort and do not strike. Equation 12 interacts with Equation 10, the price-setting relationship between wages and employ-ment, to determine the equilibrium values of wages and employment in the primary sector. Workers in the secondary sector are just paid their marginal product, which, for simplicity, is assumed to remain constant: with little capital and similar skills and each person more or less operating on their own, they are assumed to have the same marginal productivity. The model can be summarised as follows. Together with the effort supply function 8, the job offer relationship 11a then determines the equilibrium number of positions in the primary sector. Since the proportion of filled positions in the secondary sector is (1 - p), the secondary sector absorbs all those who are not em-ployed in the primary sector and who are willing to work for wage ws. (This assumption will be relaxed in the next section). Thus, in this model - as in the model of Bulow and Summers - there is no involuntary unemployment. In this section the model is expanded to contain a third sector or segment that comprises the unem-ployed. The preference hierarchy follows the model above: workers in the secondary sector prefer the primary to the secondary sector; the unemployed would prefer secondary sector employment to unemployment and primary sector employment to secondary sector employment. As in the previous section, we first consider the effort supply function. The effort supply func-tion introduces a role for entry barriers that imply that not all of those who are unable to find a job in the primary sector will be able to find one in the secondary sector. The model makes a few simplifying assumptions. First, those quitting and being laid off in the primary sector (at rate qp + d1), move to the secondary sector, while those quitting the secondary sector (at rate qs) move to unemployment (i.e. nobody moves from the secondary to the primary sector). Those of the unemployed who quit their unemployed status (at rate qu) move either into the primary or the secondary sector. The unemployed, of course, receive no wage. As before, the proportion of filled positions (jobs) supplied in the primary sector is pp, while that of the secondary sector is ps. A critical difference is that, unlike the two-sector model with no unemployment (where everyone who is willing to work in the secondary sector for a wage equal to their marginal product, ws, finds employment), in this model the number of filled positions in the secondary sector, ps, is equal to or less than (1 - pp); ps being smaller than (1 - pp) would result from barriers to entry into the secondary sector. The barriers and obstacles may include physical, financial, human and social capital requirements. The capital stock is chosen so that f'(K) = r if B* > K*. If B* ≤ K*, that is, the borrowing constraint is binding, then the entrant is indifferent between different levels of capital, since capital has a zero profit when 0 < K < K* - hence, one can expect no investment to occur. Thus, one could argue that those potential entrants whose borrowing constraint is lower than the minimum scale capital, B* ≤ K*, will not enter the secondary sector, and will move to unemployment. The proportion of potential entrants for whom B* > K*, will be defined as θ. That fraction, θ, is itself a function of the barriers of entry - the higher the barriers to entry, the lower the fraction. In terms of Equations 16 and 17, the lower B* is and the higher K* is, the higher is the barrier to entry into the secondary sector and therefore the lower θ will be. This implies that (1 - pp - ps) is the proportion of positions that the primary and secondary sectors would have supplied, had there not been barriers to entry in the secondary sector. It also means that, in this model, pp and ps are expressed as ratios of Fp + Fs, + U (which now comprises the labour force), with U being the involuntarily unemployed. In equilibrium, outflows from the primary sector need to equal inflows into the primary sec-tor from the third segment (unemployed). Thus, (qp + d1)pp = qupp(1 - pp - ps), which also means that qu = (qp + d1)/(1 - pp - ps). In addition, the outflow from the secondary sector needs to equal inflow into the secondary sector from both the primary sector and the unemployed segment. Thus, qsps = (qp + d1)pp + qups(1 - pp - ps), which (after reorganising) implies that (qp + d1)pp = qsps - qups(1 - pp - ps) (which also equals qupp(1 - pp - ps) - see previous paragraph). Therefore, there is a positive relationship between p and wp, but a negative relationship (given that g < 0) between Ep and pp (as Ep increases, wp decreases, causing pp to also decrease). Equation 10 represents, again, the price-setting relationship, while Equation 11b represents the job offer relationship. As Ep increases (and given that g' < 0), wp increases. which is distinguished by the presence of θ (a function of barriers to entry) and quit rates. which is also distinguished by the presence of θ and quit rates. In the three-segment model the unemployed are involuntarily unemployed. Those who end up in the third segment and who cannot re-enter either the primary or the secondary sectors, due to the presence of barriers to entry into both the primary and secondary labour markets, find themselves involuntarily unemployed. is the number of involuntary unemployed. The two-sector, three-segment model shows how the two-sector model can be expanded from a model that merely explains the allocation of labour between the primary and secondary sec-tors, to a model that caters for the possibility of involuntary unemployment on the aggregate level. The key difference centres on the following. In the two-sector model, workers who quit or lose a job in one of the sectors, circulate back to a job in the other sector. In the three-segment model, workers who quit or lose a job in one of the two employing sectors do not necessar-ily find a job again and may end up being unemployed. Some workers might also never have worked (and remain unemployed). In the literature (cf. Campbell & Orszag 1998:121), higher levels of employment and wages are associated with a higher quit rate - higher employment levels imply a higher probability of finding a job again once the worker quits. In two-sector model equilibrium, quit rates (as well as d1, i.e. the probability of being laid off for shirking while not actually shirking) do not affect wp, pp and Ep because in equilibrium the flow into the primary sector equals the flow out of the primary sector - those who quit find jobs in the secondary sector and are replaced, in turn, by workers moving from the secondary to the primary sector. However, because of entry barriers in the secondary sector in the three-segment model, the flows into and from the primary sector are not necessarily equal. This implies a relationship between quitting and wp, pp and Ep. In the three-segment model, barriers to entry mean that θ < 1 (θ being a function of barriers to entry B). If θ = 1, then all the terms containing qp in Equations 26-28 would disappear by virtue of being equal to zero,9 which will also mean that qp would have no effect. Thus, in this model the presence of barriers to entry (which cause θ < 1) also ensure that qp has an effect on wp, ps and Ep. Higher levels of employment in the primary sector imply that should a worker quit, the probability of ultimately finding a job again in the primary sector is higher, which, in turn, may engender a greater willingness on the part of primary sector work-ers to quit. Hence the positive relationship between quit rates and pp and Ep. Unlike the two-sector model where all workers are employed either in the primary or the secon-dary sector, in the three-segment model pp + ps ≤ 1 with θ < 1. The higher the barriers to entry B, the lower pp and ps will be, hence (using Equations 26, 27 and 28), the lower wp and Ep will be.10 Thus, barriers to entry mean fewer positions will be filled in both the primary and secondary sectors; employment will thus be lower. It also means wages in the primary sector will be lower than in the two-sector model. Furthermore, note that the higher the quit rate qs from the secondary sector, the lower are wp, ps and Ep. In the three-segment model, quitting from the secondary sector means that the worker moves towards unemployment, while in the two-sector model it means that the worker cir-culates back to the primary sector. For given quit rates from the primary and tertiary sec-tors ('tertiary quitting' being quitting from unemployment and thus moving back to either primary or secondary sector employment), a higher quit rate in the secondary sector means a higher probability of ending up without a job, even if one starts out in the primary sector. Thus, a higher quit rate from the secondary sector depresses wages, employment and the num-ber of jobs in the primary sector. 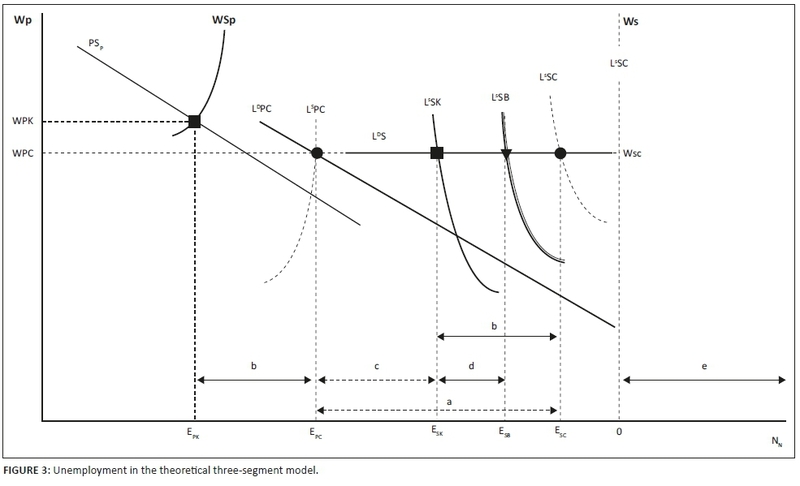 Figure 3 is a graphical presentation of the models discussed above. It shows employment in the two employing sectors on the horizontal axis and real wages W on the vertical axis. Primary sector employment is measured rightward from the vertical axis (marked WP), while secondary sector employment is measured leftward from the vertical axis (WS). NN represents the working-age population. Distance e shows those who are not economically active. Suppose, to start off, there is a perfectly competitive labour market with no market power and no efficiency wages. The wage paid in the primary and secondary sectors would be equal (i.e. there is no real distinction between the primary and secondary sectors). and represent labour supply and demand in a perfectly competitive (subscript C) labour market among firms in the primary sector, while and represent labour supply and demand in the secondary sector. is horizontal, following the simplifying assumption that the marginal product of labour in the secondary sector is constant.11 Because the markets are perfectly competitive, wages in the primary and secondary sectors would be the same, WPC = WSC, with EPC and ESC being the corresponding employment levels in the primary and secon-dary sectors. The distance marked a represents those workers who would be voluntarily unemployed - they could always find work at the prevailing wage WSC (i.e. if they are will-ing to reduce their reservation wages). Now suppose the economy is Neo-Keynesian, with market power and efficiency wages in the primary sector. This produces the two-sector Neo-Keynes-ian model (subscript K), still with no barriers to entry into the secondary sector. The wage-setting (WPP) and price-setting (PSP) relationships in the primary sector will, due to effort behaviour, establish a wage WPK that is higher than WPC. Employment in the primary sector, at EPK, will be lower compared to the perfectly competitive case, at EPC. The difference in the num-ber of workers being employed in the primary sector equals distance b in Figure 3: b = EPC - EPK. Workers who are not accommodated in the primary sector are diverted to and employed in the secondary sector. Thus, labour supply in the secondary sector is and b' (the horizontal leftward displacement from to ) equals distance b (the quantity of workers relocated from the primary sector). Notice that in this model distance a equals distance b + c, since all these unemployed workers can find employment in the secondary sector at wage WSC should they wish to (i.e. if they lower their reservation wage); they are voluntarily unemployed. Next we introduce barriers to entry into the secondary sector (for simplicity we ignore barri-ers to entry into the primary sector). Given the nature of 'effort behaviour' in the primary sec-tor, as before a quantity of workers equal to b will not be accommodated in the primary sector (compared to the perfectly competitive case). However, the presence of barriers to entry in the secondary sector means that labour supply in the secondary sector will be at - lower than the previous case's . A quantity of workers equal to distance d will be involuntarily unemployed. This constitutes the third sector or segment in the model. Unlike the case of the perfectly competitive market where workers can simply offer their labour at a lower wage, in a market with efficiency wages (with firms paying a wage to ensure effort), firms in the primary sector set both wages and prices. Hence, workers cannot increase employment in the primary sector by offering to work for a lower wage. In addition, even if unemployed workers are willing to work in the secondary sector for a wage equal to the marginal product of labour, barriers to entry prevent them from doing so. The workers represented by distance c still are voluntarily unemployed. Even in the case of a perfectly competitive market, their reservation wage would have been above the market wage - they would have preferred unemployment even in the case of a perfectly competitive mar-ket. Note that the quantity of workers b + d are willing to work in either the primary or the secondary sector at a wage of WPC = WSC, but are prevented from doing so due to the pay-ment of efficiency wages in the primary sector and the existence of barriers of entry in the secondary sector. To create a theoretical model that explains the dual nature of the South African labour market (with its formal and informal sectors) and the simultaneous existence, indeed persistence, of very high unemployment, this paper draws on the dual labour market model of Bulow and Summers (1986) and the suggestion by Kingdon and Knight (2004), as well as work by Grimm et al. (2011a) that show that barriers to entry into the informal sector exist. Following the latter authors, such barriers are defined as the interaction of a borrowing constraint (itself the result of the asymmetric information faced by lenders in financial markets) and the mini-mum scale of capital needed to earn a high return. How a primary sector characterised by efficiency wage and labour union behaviour, as well as a mark-up due to high transport cost, can explain the dual nature of the labour mar-ket. How barriers to entry faced by potential entrants into the secondary sector can prevent workers from entering the secondary sector. This constrains the effective supply of labour to the secondary sector. How, as a result, these workers end up being (involuntarily) unemployed in a long-term macroeconomic equilibrium. The secondary sector does not simply absorb all those who cannot find employment in the primary sector. The authors wish to thank REDI3x3 for the generous funding of this project, as reflected in Burger & Fourie (2015), which is a more comprehensive source to consult. The usual disclaimers apply. Both authors contributed equally to the article. 1 . Concerning the microfoundations of the model, the model assumes a simple utility function, resembling the specification by Bulow and Summers (1986), with infinitely lived agents, where utility, Ut, is a function, f, of consump-tion and shirking (or 'non-effort'): Ut = f(xp, xs + αl)/r, where x represents consumption of goods produced in the primary and secondary sectors (sub-scripts p and s denote the primary and secondary sectors). In addition, l is zero when the worker exerts effort and one if the worker does not exert effort. Non-effort is thus considered to be a consumption good, and it is substitutable for secondary sector goods. Furthermore, a is the instantaneous gain in utility from shirking/non-effort, while r represents the discount rate. Following Bulow and Summers (1986) we assume risk neutrality (so that f(λxp, λxs) = λf(xp,xs)) and preferences are homothetic and normalised (so that f(0,0)=0). 2 . For simplicity, quitting and being laid off are modelled to depend on shirking (insufficient work effort or productivity); other factors that determine quitting or being laid off can be modelled analogously. The simplification is not central to the main result of involuntary unemployment present in the full model, but merely facilitates it - involuntary unemployment will depend on the presence of barriers to entry into the secondary sector. Nevertheless, because it is commonly used in international literature, the shirking model is used here. 3 . For reasons of simplicity Equation 6 assumes infinitely lived workers and as such uses the simple formula for the calculation of the value of a consol to calculate the present value. 4 . The premium rate is (α2 - 1). 5 . .The South African labour market is also characterised by a clear skills-related stratification of the unemployed, with an oversupply of unskilled workers and a shortage of skilled workers: the unemployment rate among individuals holding post-school degree qualifications is approximately 5%, and among those who have not completed school just below 50% (CDE 2013; Van der Berg & Van Broekhuizen 2012). This article does not include these highly skilled workers into the model simply because when they quit or are laid off they typically do not move to the informal sector, but find employment relatively easily elsewhere in the formal sector. 6 . Note that h is divided by γ so as to ensure that in Equation 11 p is purely a function of the marginal product of labour and not γ: wp = g(Ep) = γb(Ep), so dividing g(Ep) by γ leaves b(Ep) = MPL. 7 . That the first term containing qp would equal zero if θ = 1 is straightforward to see. In the case of the second, recall that (qp + d1)pp = qupp(1 - pp - ps), which means (qp + d1) = qu(1 - pp - ps), with (qp + d1) appearing in the second term on the right-hand side of Equation 24 that contains qp. If θ = 1 then pp + ps = 1, so that qu(1 - pp - ps) = 0, which also means (qp + d1) = 0.) In the literature (cf. Campbell & Orszag 1998:121), higher levels of employment and wages are associated with a higher quit rate - higher employment levels imply a higher probability of finding a job again once the worker quits (more about this in section 4, which compares the two models). 9 . Why the first two terms containing qp would equal zero if θ = 1, is straightforward to see. In the case of the third, recall that (qp + d1)pp = qupp(1 - pp - ps), which means (qp + d1) = qu(1 - pp - ps), with (qp + d1) appearing in the third term on the right-hand side of Equations 26-28 that contain qp. If θ = 1 then pp + ps = 1, so that qu(1 - pp - ps) = 0, which also means (qp + d1) = 0. 10 . 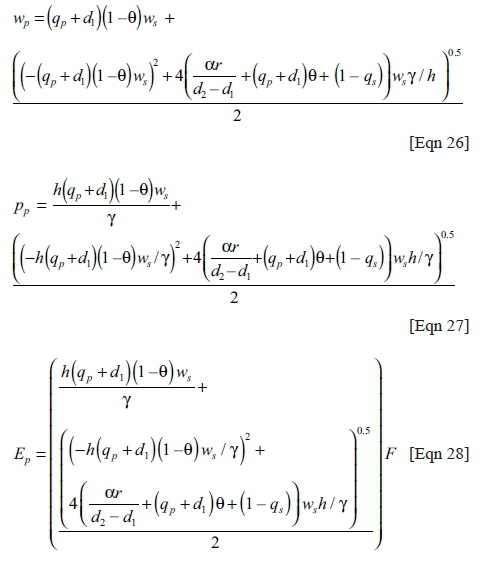 The logic is as follows: Higher barriers mean a lower θ, and the lower θ, the higher will be the first term on the right-hand side of Equations 26-28 containing θ, but also the lower will be the second and third terms on the right-hand side of Equations 26-28 containing θ. The effect of the second and third terms will exceed that of the first, which means that the net effect of these three terms on wp, pp and Ep in a case of a lower θ is negative. With both pp and θ being lower, ps will also be lower. 11 . Assuming a constant marginal product of labour for the secondary sector is not an altogether unrealistic assumption. Berry (2001:7) argues that large and medium enterprises (in our model operating in the primary sector) usually have an amount of capital that complements a number of workers. As the number of workers increase, it might lead to a decrease in the marginal product of labour. However, by their very nature, firms in the informal sector are very small, and the capital needed is replicable on a small scale (i.e. in the extreme case of one-person firms - own-employment - it is not the case that for instance a second worker is added to a given set of capital in a single small firm, but rather that the second worker can set up his or her own firm and replicate the capital - each worker is therefore the first worker and there is not really a second worker that can decrease the marginal product of labour. A similar point can be made for firms employing say two or three workers since with two or three workers, there is not much scope to decrease the marginal product of labour, particularly if the capital is replicable on a small scale. Berry (2001:7) argues that the flat marginal product of labour and thus the flat labour demand for informal sector workers has been well verified, given the expandability of the informal sector. Of course, as the discussion below will indicate, there might be financial constraints on acquiring that minimal amount of capital, which might limit the size of the effective labour supply.